This text is used as reference to this schedule and should be unique within the list of schedules. Used in Timetables and Schedule Graph. The group ID is used for filtering on the index Tab and for selecting schedules for trains. The time tolerance in model minutes for allowing trains to leave by schedule in case of delay. The cycle range in model hours for hourly and relative schedules. Note: From Hour - To Hour: "6 to 21" actually means "6:00 until 21:59"
How often the schedule will be repeated entirely. Maximum allowed delay. The default value is 60 minutes. the min. wait time in this destination is set greater than zero. Departure times correspond to the current model-time shown by the Rocrail clock. Example: A specified time of 00:01 means the train will depart one minute past midnight, with a time of 16:10 the train will start at 4:10p.m. The departure times are relative to the activation of the schedule based on model-time. The train will start on the minute. Only with a time of 00:00 the train will start immediately. Example: With a schedule time of 00:01, the train departs on the minute after the schedule has been started. With a time of 16:10 the train will depart 16 hours and 10 minutes after the schedule has been started. The specified From/To Hours are used for running this schedule. Hours are disregarded in the schedule entries. Example: With a time of 00:01 specified, the train will depart one minute past the hour. If 16:10 is specified, the train departs ten minutes past the hour. The days of the week on which this schedule can be used. This option is for filtering only for the block popup menu "Go with Tour or Schedule". If the loco in the block is of none commuter type the block enter side of the loco is compared with the schedule depart side. The schedule will be filtered out incase the enter and depart side are the same. Default is Both which has no filter function. This is a small utility to get the approximately schedule timing. Manual adjustments are still necessary. To 'learn' the schedule the departing times, this option can be used. All destination depart times should be set to zero. In case of absolute, the first destination depart time must be set. Only regular stops will be recorded, and the loco who runs for this option must have set Use schedule departure time. Each block respectively each location which shall be passed through must be specified in this table. Tip: You can use the Finder option to generate the blocks in your schedule. If no location is specified the block ID will be used for finding a route. Block permissions do not affect schedules. FiddleYards are also listed if one or more are defined in the track plan. Free text for use with actions as variable %callertext%. See Dynamic Text for more information. The departure time is regarded by trains which has set this Option. Enabled (default): The selected destination is a regular stop, e.g. a railway station where the train should stop. The specified departure time (see above) will be used. Disabled: The selected destination is not a regular stop. The train will pass through, if possible and the departure time will be ignored. Usually the Wait Option of the block should be set up in a way the train is not forced to a stop due to this setting. See also Block types and train types. If set to + or - only the route is used which match. If set to Both a commuter train could select a route in both directions. The minimal wait time in minutes before departing and will disregard a delay. Disable Block wait for schedules to use departure time and minimal wait only. With the enter event and the detection of the next destination of the schedule one or more Actions can be triggered. In the column "Actions" is displayed if an action is triggered in the block respectively in the location. 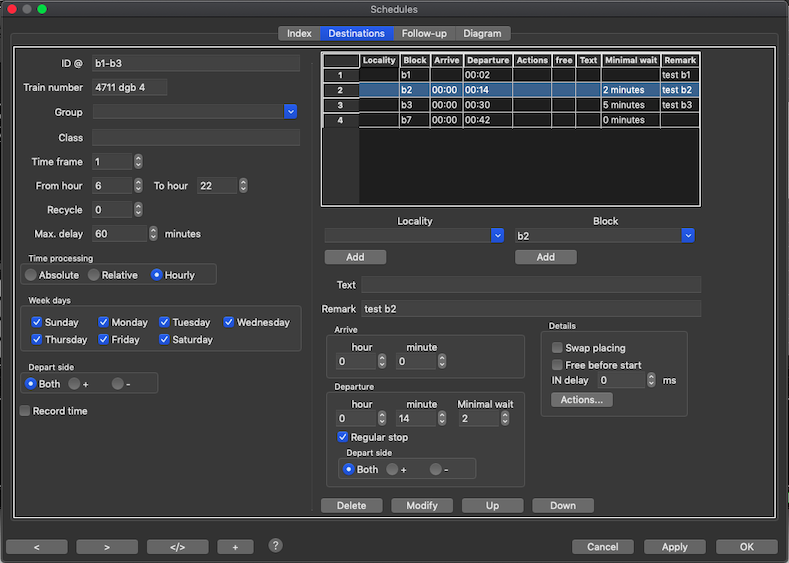 Actions in the last entry in the schedule are set in the dialog Timetables: Follow-up . Swap the locomotive placing flag before going to the next schedule destination after reaching this destination. Use with care and read the Directions in Rocrail first. Block or location must be free before starting the schedule is enabled. At least one block must be free in case of a location. This is only checked if the train starts at the beginning of a schedule, and with disabled option "Check for free destinations until reaching in". Delay for the in event in mS. This option can be useful for shunting or for trains which should roll a little further for this schedule entry block. This will overwrite the block event timer for enter2in. Remove the selected entry from the list. Write the changed values into the selected entry in the list. Move the selected entry in the list one position up or down.